Thanks to Dr. Samah Saharti, University of California Irvine Medical Center, for contributing this case. To contribute a Case of the Week, follow the guidelines on our Case of the Week page. 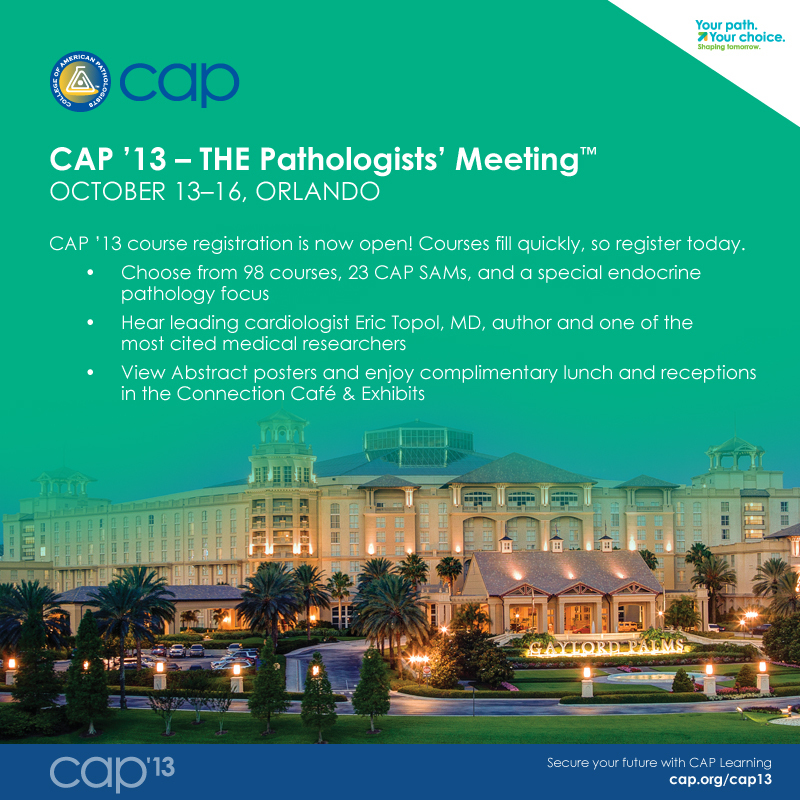 (1) Visit us at ASCP on September 19 and 20, Booth #700, and say hello to Dr. Pernick. We will be giving out $50 Amazon.com gift cards by drawings on both days. (2) Our Feature Page for September highlights Antibodies / Biomarkers and includes Advanced Cell Diagnostics, Inc. (ACD), Cell Marque, Leica Biosystems and Ventana Medical. Each month, we also have a new Mystery Case on the right side of the Home Page. (3) We have recently updated these topics in our Stains and CD Markers chapters based on reviews by Nat Pernick, M.D. : CD8, CD10, CD11 (CD11abcd), acid fast, acridine orange, ACSM1, actin-general, actin-alpha cardiac, actin-muscle specific, AF4 and BUB1B. We try to post new markers every month from the major pathology journals, but if we have missed any, let us know. If you would like to review / write about any markers, please let us know, and we can tell you the procedure. We are now focusing on converting the rest of the CD Markers and Stains topics to topic format, and will then pick up the pace for updates. (4) We have recently changed the colors for visited links on our updated pages. As always, links to subscription based journals are navy and links to free full text references are green. Now when you click on them, they will turn to a lighter shade of blue and green. We hope this will make it easier to keep track of which links have been viewed. For an example, take a look at Bone marrow - Gelatinous transformation, click on a few links, and let us know what you think. (5) On the Case of the Week page we now list upcoming cases with their contributor's name and the number of cases pending in our queue. Currently, we have a 8-9 month turn around time from when we receive your case to when it is posted on our website. If you are a frequent contributor to our Case of the Week page, please only send us a maximum of 5 cases per year. A 58 year old man with hypertension presented with urinary frequency, urgency and nocturia. He had a hard prostate and a PSA of 1.9. 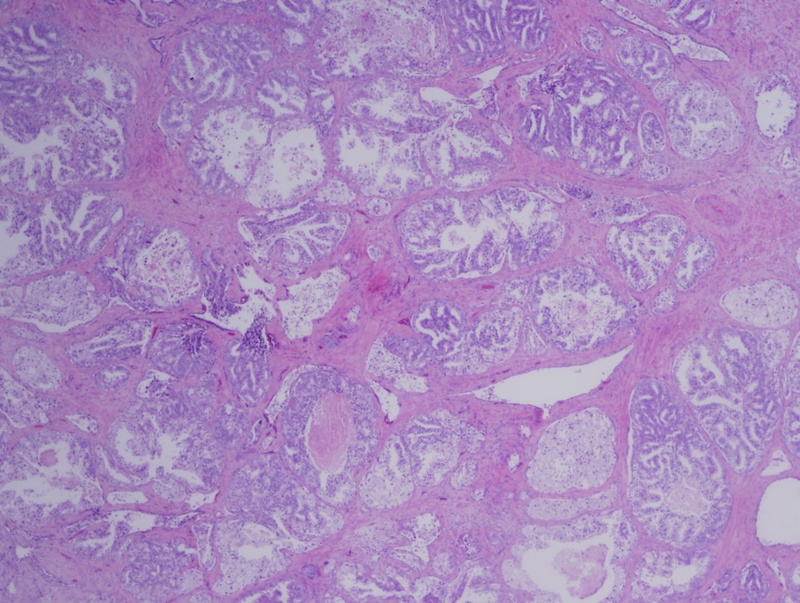 He had a prostate biopsy (shown below), and then a radical prostatectomy with lymph node dissection. 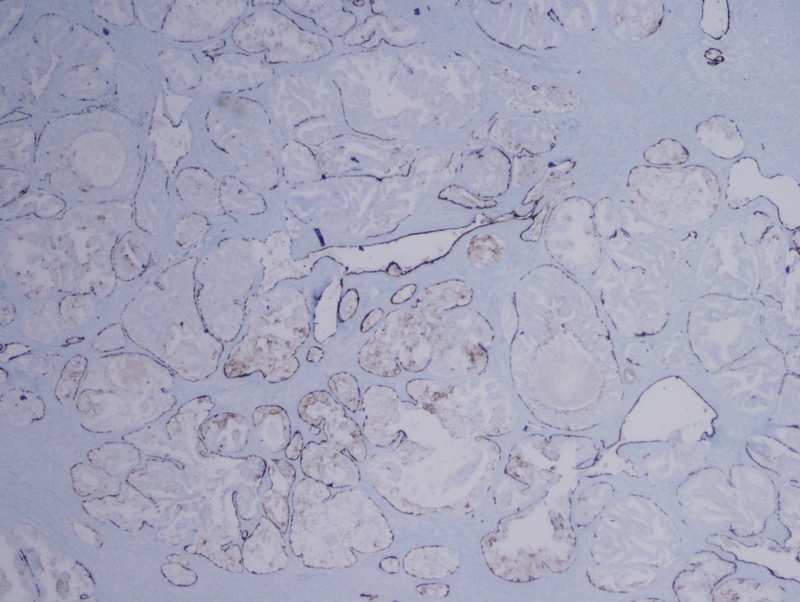 The biopsy showed intraductal carcinoma with foamy gland features in 5 cores in the left lobe, and intraductal carcinoma with foci suspicious for high grade invasive adenocarcinoma in the right lobe. In the prostatectomy specimen, there was 90% involvement of Gleason grade 5+5=10 invasive adenocarcinoma, but lymph nodes were negative. The tumor was staged as T2c N0 Mx. Intraductal carcinoma of the prostate is an uncommon biopsy finding. It has been defined by Epstein et. al. as malignant epithelial cells filling large acini and prostatic ducts, with intact basal cells, in either: (1) solid or dense cribriform patterns or (2) loose cribriform or micropapillary patterns with either marked nuclear atypia (nuclear size 6 x normal or larger) or comedonecrosis (Mod Pathol 2006;19:1528). More than one pattern is usually present. 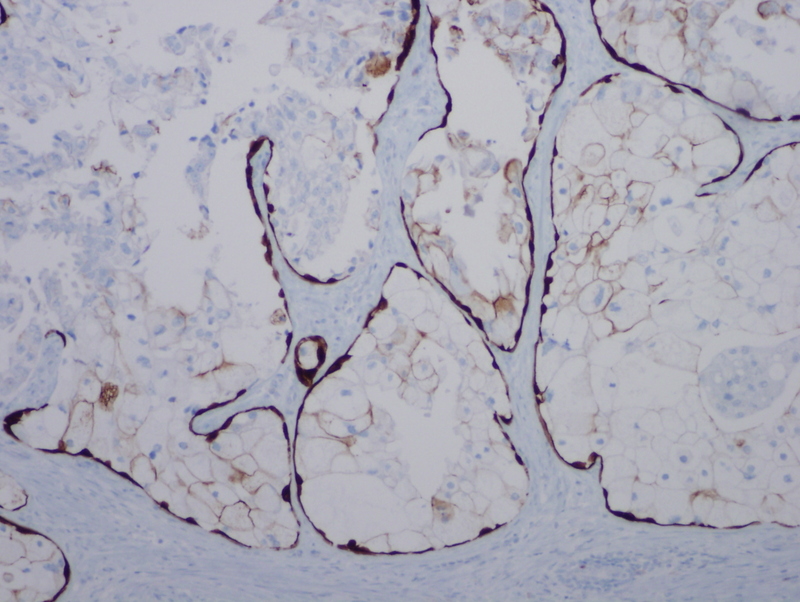 The presence of basal cells can be confirmed by CK903 or p63 immunostains. Intraductal carcinoma of the prostate at biopsy is frequently associated with high grade, high volume adenocarcinoma and poor prognosis, suggesting that it represents an advanced stage of tumor progression with intraductal tumor spread, and not a precursor lesion (Am J Clin Pathol 2010;133:654, Arch Pathol Lab Med 2012;136:418). The differential diagnosis includes high grade PIN, which is less often associated with invasive disease, and by itself, has a better prognosis (J Clin Pathol 2007;60:856). 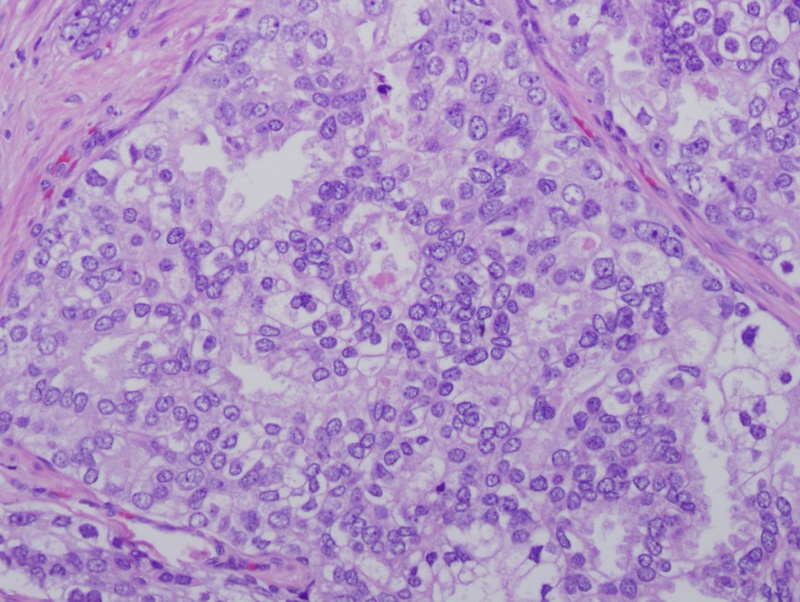 Important diagnostic criteria for intraductal carcinoma that may help distinguish it from HGPIN include marked nuclear pleomorphism, non-focal comedonecrosis (>1 duct showing comedonecrosis), markedly distended normal ducts/acini, mitotic figures, ERG nuclear staining and cytoplasmic loss of PTEN (Korean J Pathol 2013;47:307). Intraductal carcinoma should also be distinguished from invasive cribriform prostate cancer and urothelial carcinoma involving the prostate.